The RUNT Fork Add-On is an air spring system that threads into the top air chamber of your FOX 36, RockShox, Lyrik, Pike, Yari, and Revelation fork, replacing any volume spacers. The patent-pending design provides coil-spring-like performance from your air sprung fork, creating a near linear compression curve while maintaining infinite adjustability. This is the RUNT Fork Add-On? Complete package – Comes with shims to custom tune your damper to your body weight for most forks if desired. Optimal Initial Stroke – Traction is dependent on your tire maintaining continuous contact on the riding surface, therefore optimally your suspension’s initial stroke should be as supple as possible for small bump sensitivity. 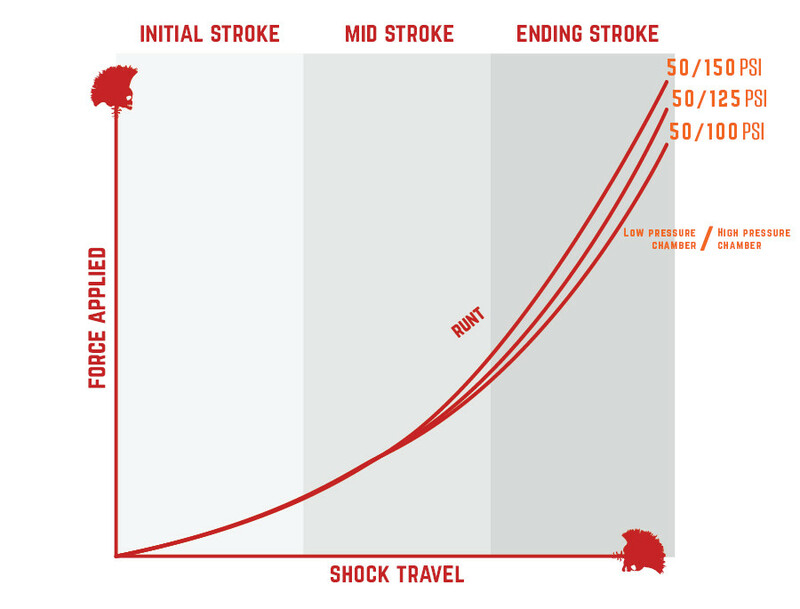 Optimal Mid Stroke – Cornering is completely dependent on support in the mid-stroke. If the suspension curve is too low through the mid-stroke, your cornering will suffer drastically as the front end of your bike will dive and your geometry will change. Proper mid stroke support also helps keep your fork from diving while descending. This helps preserve your geometry making your bike more stable. Optimal Ending Stroke – The RUNT Fork Add-On offers adjustable bottoming resistance without compromising your initial or mid-stroke. 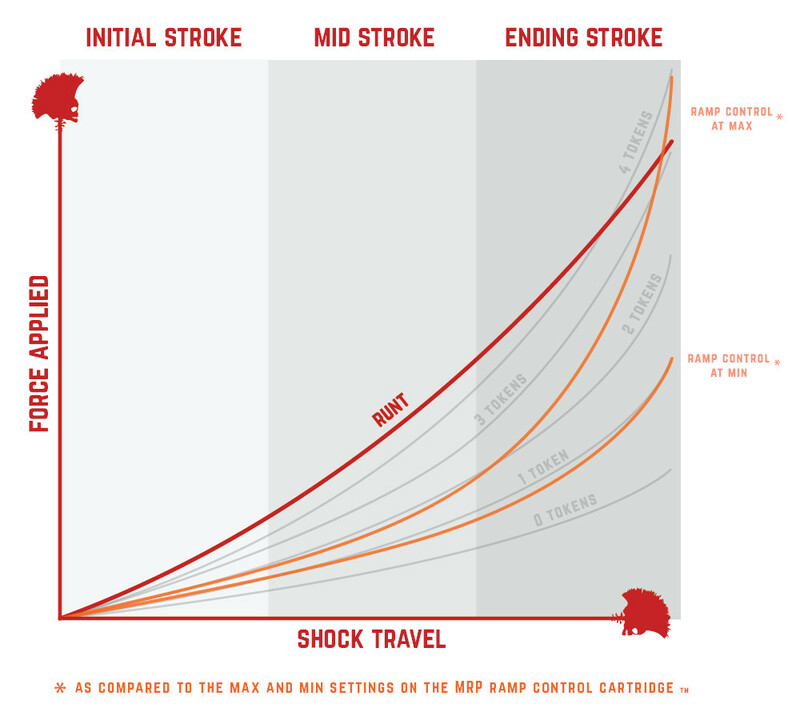 A steady linear compression is the holy grail of air suspension. The most common problem with an air fork is the tendency to have an overly supple beginning and mid-stroke, and then a drastic spike in compression towards the end. This contributes to a less than optimal suspension set up, either sacrificing small bump plushness for stiffer cornering performance or vice versa. The RUNT Fork Add-On solves this. As demonstrated in this animation, The RUNT Fork Add-On is set to a specific psi. When the air spring’s pressure reaches the same pressure in The RUNT, The RUNT’s floating piston begins to move. This allows for a linear pressure curve previously impossible in air sprung forks. A: No, The RUNT Fork Add-On works well as a drop-in and will be an improvement to your ride. That said, we have been re-valving forks for years as they are not very supple from the manufacturers. Re-valving makes your fork ride even better! The RUNT Fork Add-On is shipped with shims to re-valve your rebound damper and/or your entire damper. On some forks the lock-out feature becomes less effective. Your local bike shop can do this for you or you can send it to us. Many riders choose to take this one step at a time. A: The RUNT Fork Add-On is super easy to install. You simply remove the air in your left fork leg, remove the top cap and any spacers or tokens, screw The RUNT in, air it up, and you are ready to ride. The process takes about five minutes. A: The RUNT Fork Add-On, unlike other options out there, is fork travel specific and was designed to take up the maximum air volume in your fork leg. We do have flat and step pistons that allow you to convert between 150mm and 160mm of travel, for example, by ordering a different piston. A: The RUNT Fork Add-On requires very little maintenance. Once a year we suggest replacing and lubing an o-ring contained inside. That’s it! Visit the Diaz Suspension Design website for more details.